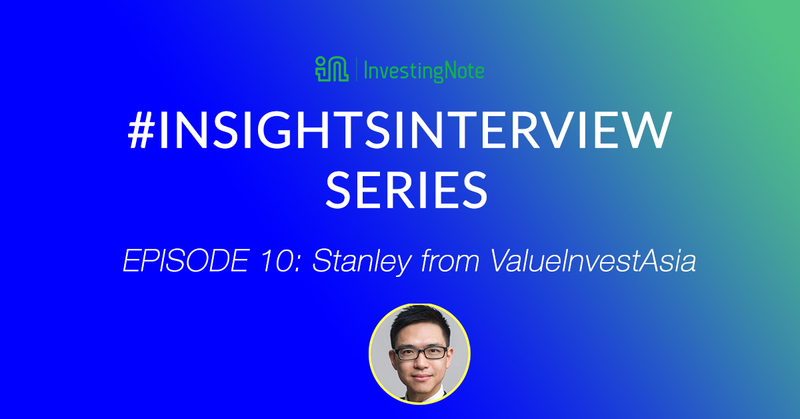 This is # InsightsInterview Episode 10 with one of our veteran contributors on the InvestingNote Platform, Stanley Lim, with the username @ValueInvestAsia. Tell me more about yourself and how did you get started? I am an engineer by training. I took an internship at Volkswagen in Germany after I graduated and realized that engineering is really not for me. I went back to Malaysia and took a job at a local car manufacturing plant. At that time my starting pay was SGD 500, then I realized this is not a career for me so I want finding new ways to earn more money so I found the stock market and Warren Buffett. Then I joined the CFA program and try to get into the finance industry, which I did after trying for a few years. What was the biggest takeaway from your time working at The Motley Fool? It was a great time, a bunch of guys sitting around everyday chatting and reading about stocks. What’s not to like? But it also taught me the true potential of the internet and how information are being democratised. Depends if you are talking about my biggest win and loss in term of monetarily or on the best and worst investment that I learned the most. Skillwise, my biggest win is buying into Facebook when it was at a P/E of 100x. It is the first growth company I have ever bought and it really thought me how important it is to know more about the quality about the business than its valuation. Even after the recent scandal and bad press surrounding the company, my position is still significantly up, just because it has grown so much. My biggest loss would be buying invest into this S-Chip called Eratat Lifestyle. I bought it at 1x P/E and the company was giving a 4% dividend and trading at net cash. But of course it turns out to be a fraudulent company and got suspended. Although I sold in time and didn’t lose much money in it, but it taught me a deep lesson of going after quality more in the stock market. Cheap rubbish is still rubbish. When you evaluate a company, how much time do you spend on understanding the business versus doing the valuation work? My rule is if I can prove that the business is superior or one of a kind, I would pay little attention to the valuation. But if the business is just average, then I was a good price when I invest in it. But more often than not, I will go for quality first. “Be greedy when others are fearful.” - Warren Buffett. How true is this statement from your experience of the SG stock market? Very true, but the problem is we as investors always assume that we can be the one that is greedy when others are fearful. However, why are we special than others? In my case at least, I found that I am just as fearful when others are fearful. So the advice is useful in theory but extremely hard to implement in practice. What is the most common misconception that investors usually have when stock picking? To me, the most common misconception is that we have to buy “cheap” stock. Even Warren Buffett said that he rather buy a wonderful company at a fair price than a mediocre company at an amazing price. So we should really focus more on quality than valuation. What valuation methodology do you use when selecting stocks? Depends. As mentioned before, when it is a one-of-a-kind type of company, I might not even look at valuation. For normal companies, I tend to go with the basics, P/E or dividend yield. What sets apart a good stock from a bad one? What are the key criterias? Many factors but the two key factors I look at is that the company must be in a growing industry and the company must be growing too. Regardless of how attractive the management or valuation is, if it is in a dying industry, I stay away. Second is that the company should have a unique economic moat. It must have something special that is protecting its margins from its peers, be it brand name, scale, or regulation protection. What do you think of the current environment for the Asian equity markets, and can you share with us some of the positions you are vested in the Asian markets? My portfolio is quite diversified with more than 40 companies. So I invest very small position in each companies so that even if I made a mistake, it is not a big hit for me. In Singapore, I am warming up to the REITs as I feel Singapore is one of the best markets in the region with high quality real estate and managed very professionally. So many of the Mapletree, CapitaLand and Frasers REITs are quite attractive to me. What should investors do when the stock has been in a downtrend for some time, yet is undervalued and having consistent financial results? Stanley from ValueInvestAsia provides a lot of insightful posts on InvestingNote. Follow him to get the latest updates and educational posts on the Singapore stock market. To learn more on where to get started, we have other topics on investing here.